Propelled by the syncopated, asthmatic breath of an accordion, the song gimbals and gyres, wheeling like the robes of a dervish. 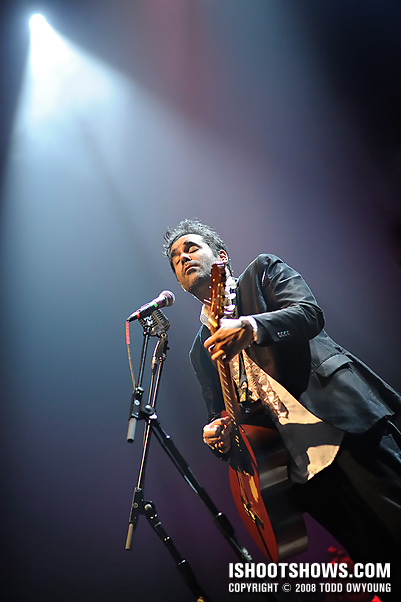 Nick Urata takes the mic, crooning with an languorous insistency that seems singular in its melancholy until the strings come in, swirling in ascending pulls throughout the great hall. 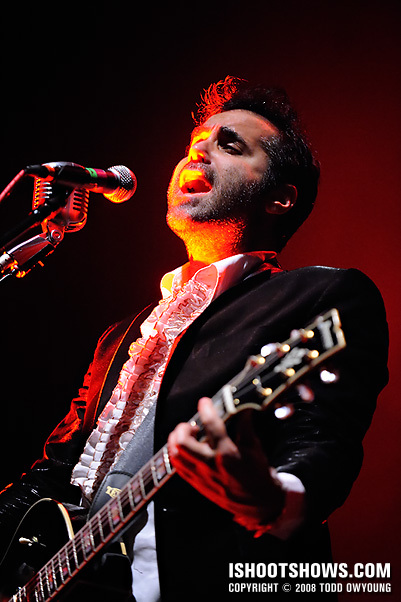 This is the sound of Devotchka. Lead by Urata, the Colorado four-piece played to a rapt audience at the Pageant, weaving an epic blend of Bolero, Romani, and Mariachi in a punk-folk-rock maelstrom. 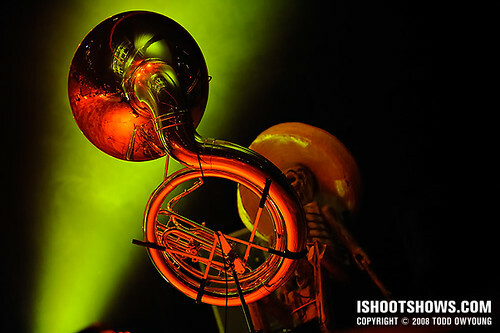 Bathed in dramatic lighting, the members deftly juggled their own musical contributions throughout the night, with each member playing no less than two instruments during the performance. 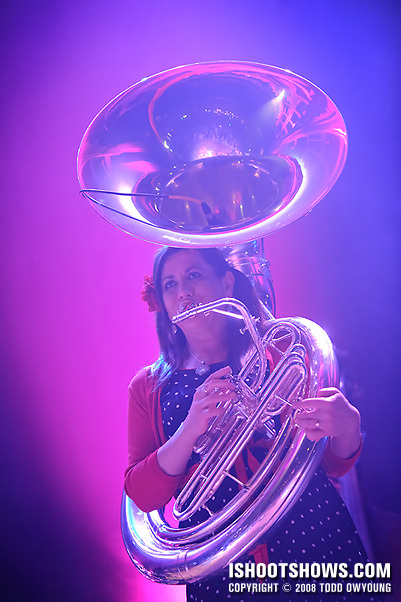 Tom Hagerman switched between accordion, violin, and piano, while Jeanie Schroder, affectionately called out as the “Super Human, Super Tuba Girl” by Urata, held down the low frequencies on sousaphone and upright bass. 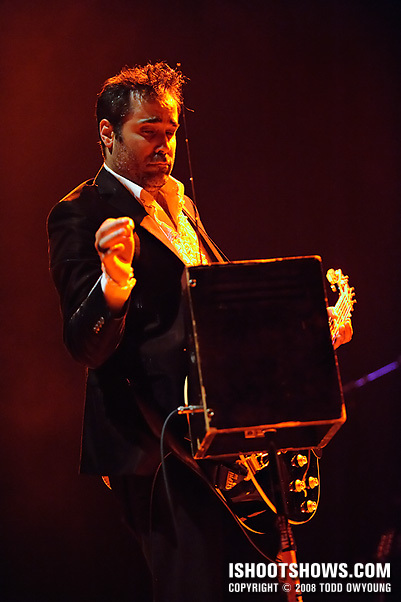 Percussionist and trumpet player Shawn King provided much of the band's brightness, while singer Nick Urata switched between guitar, bouzouki, and theremin during the course of the performance. 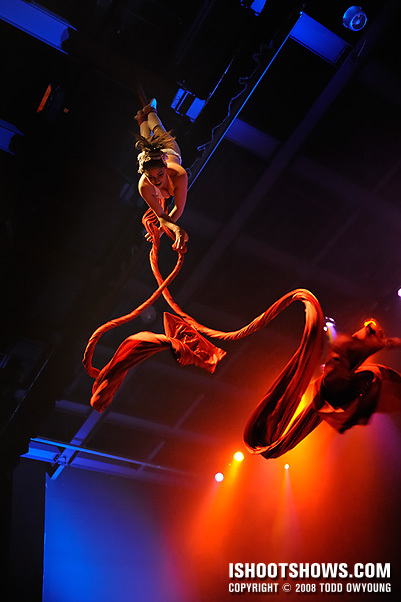 Wound in a red band of cloth secured to the rafters, the acrobat build tension during the song's extended intro. 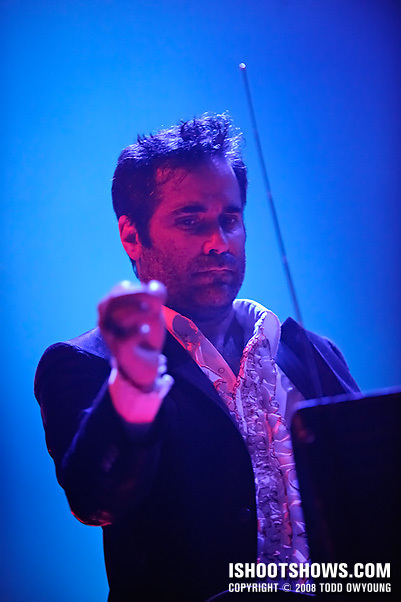 As the song built, Alexandra played off the song's spiraling cadence, winding up and unraveling to the eerie tide of the theremin as Nick Urata looked upward. 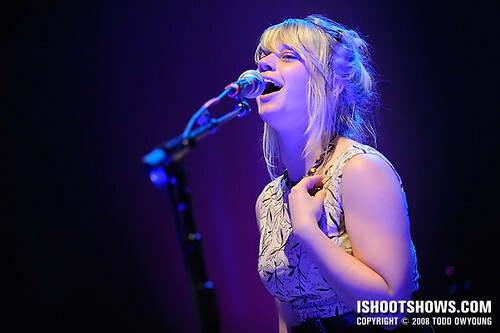 Canada's Basia Bulat opened for Devotchka. 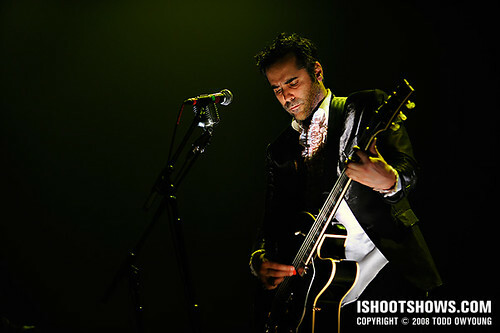 Having photographed Devotckha just three days before at New York's Terminal 5, I was keenly interested in what differences there might be at the Pageant as I stepped into the venue. One of the first things I always do is check in with production at the venue to get a sense of the ground rules for the evening. While I was hoping for a nice, beautiful photo pit, it just wasn't meant to be as I checked in. I was informed that the barricade at the front of the stage was just set up as a drink rail, meaning there was no access for this show. 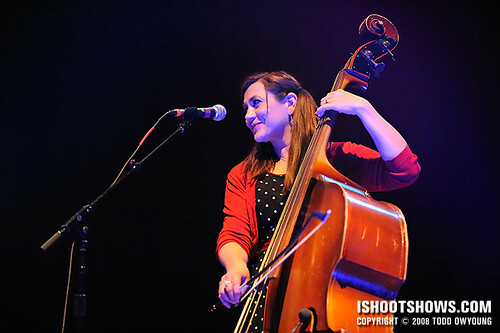 I was not informed of any song limitations (i.e., I was shooting all night). So, I grabbed some railed and waited it out. All of the the images were shot from a stationary position. The lighting for this performance started off dark. Really dark. Frankly, I didn't even shoot that much during those first few songs, and I'm doubtful if any of those shots are in the full set. I was pleasantly surprised, however, that the lighting effects did pick up as the show progressed and came together into quite a nice show, with deep color washes and dramatic lighting, especially for Shawn King and Jeanie Schroder. 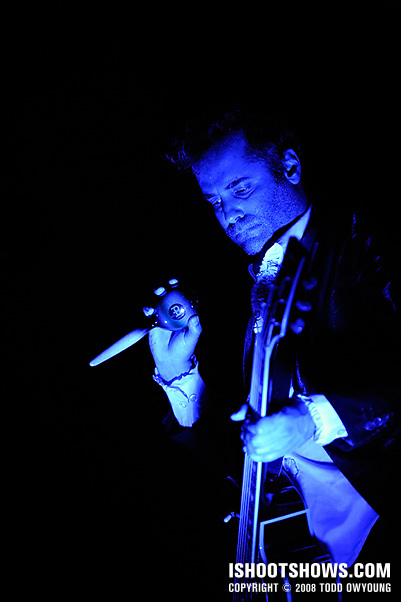 Compared to the New York performance at Terminal 5, the use of the dramatic under lighting took on an interesting progression during the course of the set, shifting to an electric blue from the hot magenta that I'd seen before. While this lighting had me spinning dials in NYC, nailing the underlighting for Nick Urata was one thing on my agenda for the evening. I used the Nikon D3, Nikon 24-70mm, and Nikon 70-200mm for this performance. Due to the highly restricted position, I relied on the reach of the Nikon 70-200mm for much of the performance, and the telephoto lens was essential for helping bring the action to me. 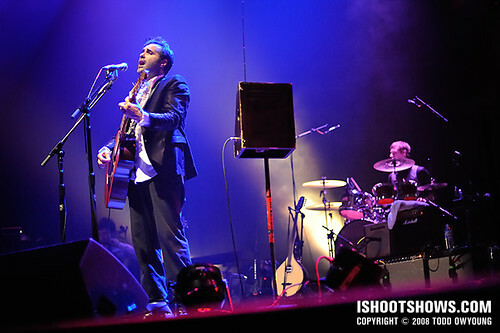 Needless to say, having shot the entire set, exposures for Devotchka's performance were all over the place. 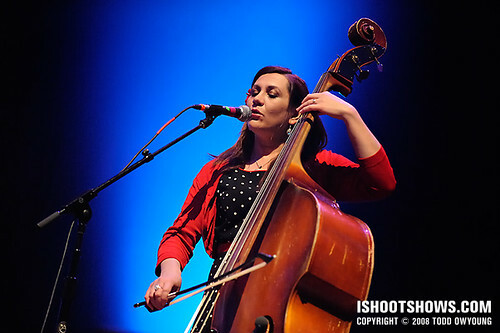 For the majority of the set, I shot at ISO 1600, between 1/60 and 1/160 at f/2.8. 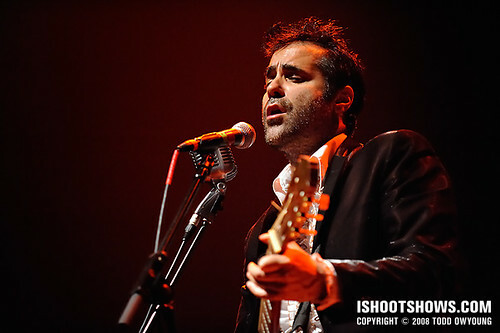 Having just come from photographing Devotchka's performance at Terminal 5 in NYC, their show at the Pageant was a stark contrast. 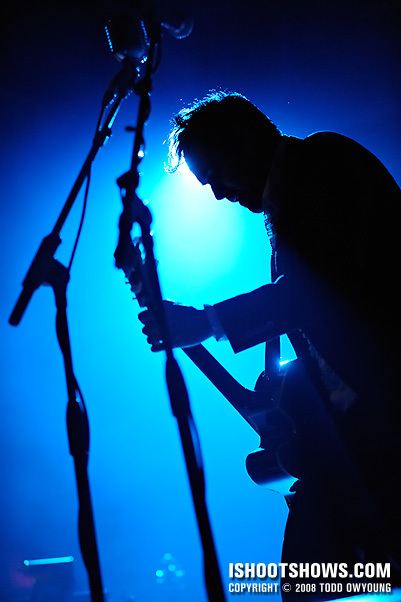 Overall, the biggest difference was shooting three songs at Terminal 5 versus the entire set at the Pageant, a factor that contributed hugely to the images of the latter show. While I would consider the lighting for the first three songs at the Pageant inferior to the quality of light at Terminal 5, what Pageant's shoot lacked in sheer impact it made up for in duration. Still, I considered the stationary position for the Pageant set an interesting trade off for unlimited shooting time. 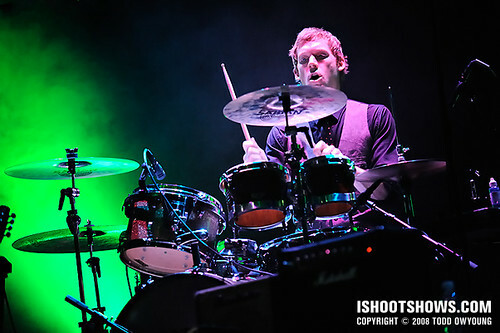 Please be sure to check out the images from Terminal 5 if you haven't already seen them. If you had to pick, which would you choose: three songs and unlimited movement in the pit, or an entire set with only one shooting position? I love the shots of the dancer. I think I would take the fixed position and unlimited shooting, but that’s only because I think I’m a “slow” shooter. I often feel I need time to warm up, though I can’t say I’ve ever checked to see if my later shots tend to be better than the earlier ones. However, having just become aware of the “first three” standard, I think I will begin to set that limitation on myself to see what I can do under the time limit. Hey Cameron, thanks for your feedback on this set, and for giving your thoughts on the shooting question. I think one’s personal “pace” is a really interesting factor in the split that I hadn’t considered, but it definitely plays a role. First things first, that I must get off my chest: OH MY GOD I LOVE 16 OF THE AERIALIST. I feel better. But seriously, I’m absolutely attracted to that shot — as I scanned through them quickly (I scan, then go back and read your posts and look at them more closely) it instantly caught my eye… I cannot tell you how attracted I am to it. Ok wow, and I just saw this one , which I instantly love as well. I think it’s the lines in her rope/thing (dunno the specific word. I also like 2, 4, 13, and 14 after the jump. 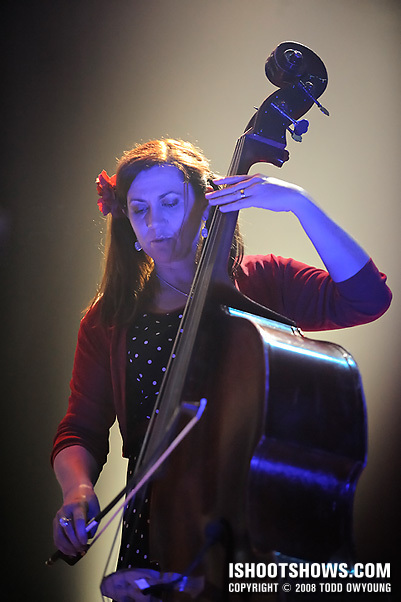 The wash behind the cellist and the white light on Urata along with the wider angle provide for a shot with huge impact. I initially didn’t like 13 because it seemed somewhat posterized, but I find myself attracted to it more and more for some reason. 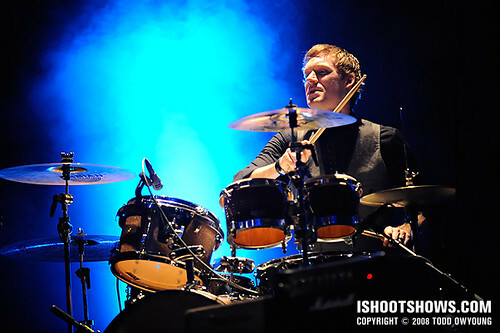 I like 14 because of the night tight shot of the drummer and the look on his face. These were interesting as well, and a nice touch to the set. I think shots like these are also great because it separates him completely — there is seemingly no background and his face is completely lit, which I think is very interesting. Comparing it with your last set on them, I don’t think I would choose one over the other, but they are certainly different. There are many more colours from the Pageant, whereas Terminal 5 gave you constant blue washes it seems. I still love this shot . And to answer your question — 3 songs, unlimited movement — hands down. I like having options, and think it would give me more of a chance, even though I am still learning. Something I’ve realized with these dive shows I’ve been shooting is that the lighting is absolutely constant — I set it in the beginning and shoot for 30 minutes without thinking about lighting — that’s probably not good for me (should get used to it), but hopefully it will teach me things about framing, etc. Moving would certainly help out with that — so I’ll take my chances with the 3 songs. 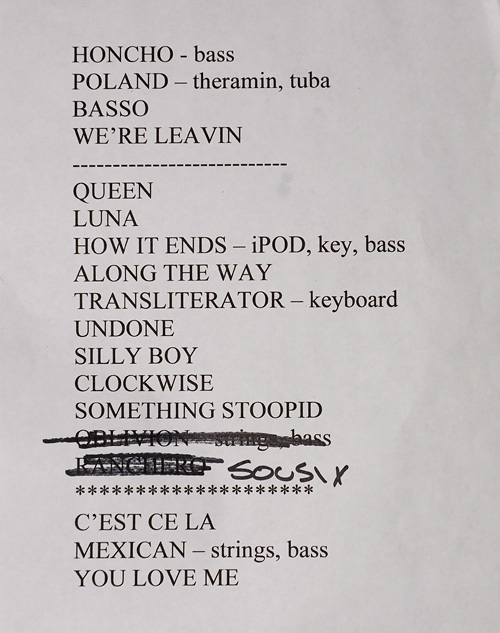 Again, great set — sorry for the long post! I never mind long comments, thanks for all your shots on this set. On the aerialist shot you picked, shooting that was pretty frantic, as everything was happening fairly quickly. The setup took a minute to so for each “move,” but all the twirling, unfurling, and waving took place in dramatic fashion. 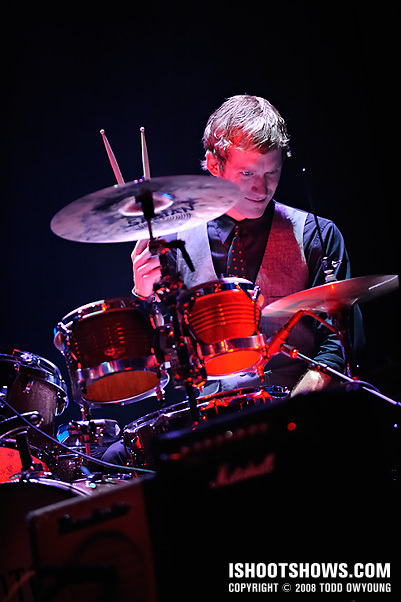 On 13, Nick was being blasted on one side by the a light on the stage, which is totally blowing the red channel. I actually underexposed this shot on capture and brought it up in post, just to be conservative with the exposure for such an extreme lighting instance. Even though the band on stage was the same, and had similar lighting rigs, the Terminal 5 and Pageant shoots couldn’t have been more different. It’s hard to pick one over the other, but I think they each had their strengths and weaknesses. Overall, the lighting on Urata was better at Terminal 5, with stronger, cleaner light on him. By contrast, the Pageant’s front-lighting was weaker and less clean, especially during the first three songs. Thanks for your thoughts on the shooting limitations question. Yeah, divey shows often have lighting that is often constant or flat out boring. 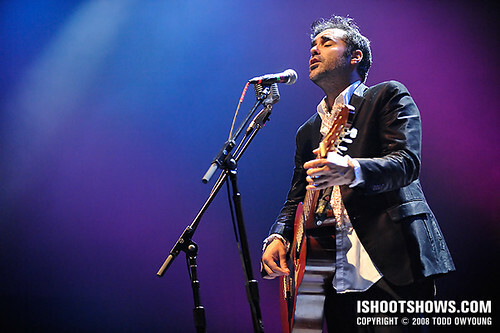 The long shooting you’re getting in will help you will understanding how to photograph musicians, which is key. This basic skill is what you’re going to fall back on when you’re under a time crunch to deliver in three songs. 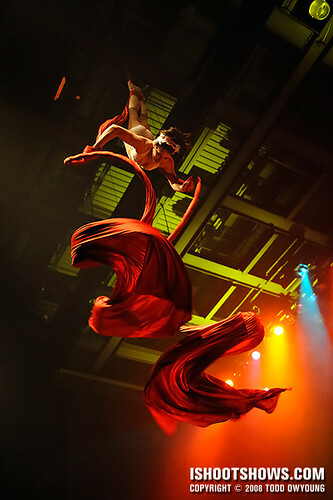 Fantastic shot of the aerial acrobatic dancer in this photo. Thanks for your pick, Bryan. I was talking to the lighting tech for this show and he said that the final approval for the acrobat didn’t come in until just before the show. Apparently there are different requirements for each state regarding insurance coverage and such. New York might have had higher requirements that prevented her performance. I love this set a lot, but I have to agree with Bryan – that dancer shot is a grand slam. Thanks, Janet! I appreciate the pick, nice to hear from you. near a huge wall of speakers? A few of my photos were ruined by vibration even when I shoot at over 1/100s. I haven’t experienced much camera-shake as a result of speakers, or at least haven’t linked blur to the speaker vibrations. Subject motion is always the prime concern for reasonable shutter speeds. I have, however, had some camera shake from a heaving floor, which happened at Webster Hall in NYC. Also, I was shooting with the Nikon 70-200mm f/2.8 VR, which has image stabilization, so this certainly helped in some instances of camera shake. Awesome set, I think the one of the dancer while she is facing away from the camera is a little unflattering, and has weak composition. The one of her high in the air and draping those ropes around is epic, great work on that one. Awesome stuff as usual. Hey Zach, thanks for the comment. Photographing the aerialist was a tricky task, to say the least. It definitely made for some interesting opportunities. As for Radiohead, you’ll just have to trust me on this: if and when I can post them, I absolutely will. To answer your final question, it all depends on where you are and who you’re shooting. If you’re shooting quite a static artist with a view of quite an uninteresting member I’d prefer a 3-song policy. 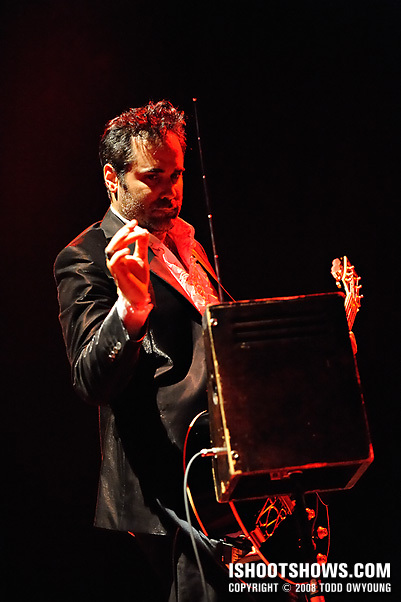 However, with such an interesting act like DeVotchka, stationary for all songs is brilliant. Thanks for the response on the shooting question. I agree, it depends entirely on the band and circumstance; I don’t think there’s a single, one-size-fits-all setup that would work for all gigs. 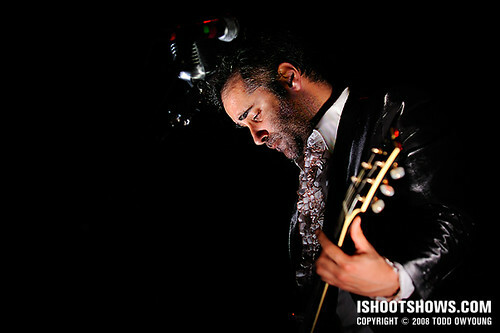 Even between Devotchka’s two performances, it’s hard to pick between which limitation I would choose if I shot them again.